Cubra mucha más distancia que caminando y disfrute de la flexibilidad de detenerse a menudo. Aprende sobre la historia de las atracciones que pasan con tu guía. Ver iconos antiguos como el Coliseo y el Foro Romano. Muy recomendable para los que como nosotros hacíamos una visita relámpago a Roma 3 dias. El Bike-tour, genial. Nuestro guía Santi encantador. Lo pasamos genial con nuestra guía Emilia que nos llevó por maravillosos lugares romanos. This would have been a great tour but too many people to try and bike around. My wife fell 3 times. I wished that she would have used a smaller bike. The tour hits all the spots and the biking is easy but you need to be a good biker to do this. You are on the streets with all of the cars and mopeds and is difficult to maintain balance in very, very tight spaces. I will start by saying Viator is amazing! We had booked this tour and the day of there were torrential downpours. We called and they rebooked us later in the week. The reason I give it a 2 star is because our guide was nice but was not concerned in the least with our whereabouts or safety procedures. Big bustling city there are still rules to crossing through traffic. She would take off in front of on coming traffic not willing to wait for the light to turn green she was almost hit twice during our excursion. There were numerous vehicles and pedestrians stopping to give her a piece of their mind. We also had an issue with one bike that required additional time at a stop and she was gone through the square and down an alley before we caught up to her. She did not look back once to check on us. We brought our own water and glad we did. There were no convenience stops. We were able to hold our own as we were familiar with Rome however I can't imagine this tour with a larger group or children. We were so lucky with this tour. There were four of us and just the four of us on the tour. Perfect. Our guide was lovely and gave us a whistle stop tour of Rome, stopping at all of the prime tourist spots and allowing us enough time to take a quick look and take a few photos. She gave us lots of information about the various historical sites. We were so lucky with the weather too, it was forecast rain with thunder and lightning, but we only had a 15minute quick shower. I can't quite imagine that we would have enjoyed it as much if it had rained the whole time. 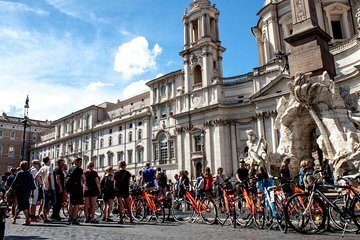 We would usually tend to do a walking tour, but I have a problem with my foot at the moment which meant that I wanted to try and limit the amount of walking I was going to do over the course of the few days we had in Rome, so the bike tour was a perfect solution and ticked all the boxes. Any tour like this, gives you a start on getting your bearings with where everything is and can even give you more ideas on places you might not have originally considered seeing and also on spotting bars and restaurants to try out. Not sure how well it would work when it is high season, with more pedestrians and cars to deal with. But for us it was definitely well worth it. Arrived to find the cycle co knew nothing of our booking. As a result, we had to go with a French-speaking couple. The guide had limited information and time, trying her best to speak to both couples alternately. It really reduced the point and pleasure. The bike co offered a free alternative but..
A beautiful day in Rome traversed by bike. Our tour guide was knowledgeable, friendly, and extremely patient as we peddled through the streets of Roma. He gave us plenty of time to take our wacky photos and he even offered to watch our bags. Catalina was amazing! She shared lots of information and history on all the locations and as we rode around town. We made all the highlights that we were hoping to see and couldn't be happier. It was a perfect way to explore the city. This tour is so much fun. We cycled casually around Rome and stopped at all the iconic sights along the way. Our tour guide was fantastic. Our booking two days earlier had to be cancelled due to unforeseen rain so my husband and I, along with six others were accommodated in a tour two days later. We only speak English and the other six guests only spoke Portuguese. The guide effortlessly switched between the two languages to explain each sight and patiently waited for any guests who got left behind due to traffic lights, etc. This tour is a great way to see Rome and I would recommend it to anyone visiting Italy's capital.